Alsace is famous for its gastronomy, its wine, its history, its idyllic landscape and its beautiful timber-frame villages. With over 2500 km of cycle paths, Alsace is also a paradise for cyclists. 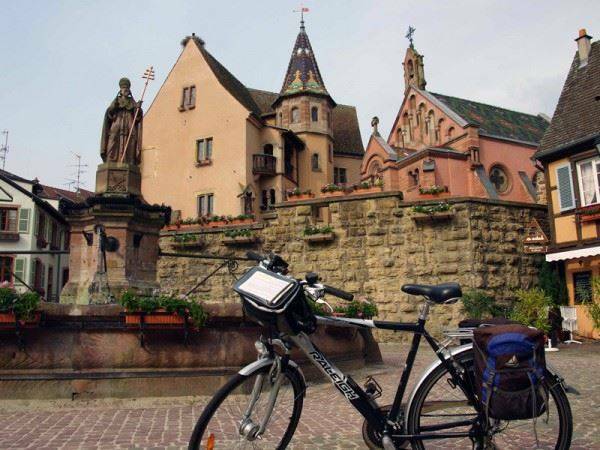 This tour shows you the best side of Alsace and leads you along the most beautiful cycle path network in France, through one of its most magnificent regions. Arrival in Strasbourg. Transfer to your hotel (not included). It is time to to explore this impressive city. Leave Alsace on the cycle path along the Rhone-Rhine Canal into the "Ried', the former Rhine flood plain between the Vosges and Black Forest before the river was canalised. You will leave Strasbourg along the Rhone-Rhine canal which will lead you along its very pretty cycle track into the heart of the Ried. From Colmar head east to Neuf Brisach, then continue towards the south to reach the gentle village of Ottmarsheim with its 12th century nice church. Next you enter the Hardt's forest then you go along the Huningue's canal to reach Mulhouse. After enjoying the historic town center of Mulhouse, you have plenty of museums to visit. You will leave the banks of the Rhine and the villages of the Sundgau and ride to Ungersheim, until the Ecomusee d'Alsace. You arrive in Guebwiller, nestling at the foothills of the Vosges. At the foot of the Vosges nestle the winemaking villages responsible for the reputation of the Alsatian Grand Crus: Eguisheim, Turckheim, Kaysersberg and Riquewihr. 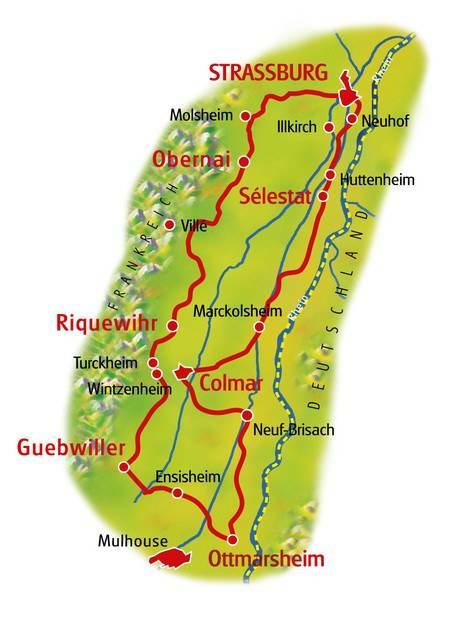 Along the Wine Route you will discover the villages of Ribeauvillé, Bergheim, Andlau and its abbey, Barr and Obernai. Country roads and cycle tracks will take you from Rosheim and to Avolsheim. From there, along the cycle track on the banks of the Bruche canal, you will reach the capital of Europe: Strasbourg. You can end your tour here, or stay for extra nights upon request. You will ride mainly on cycle paths, on minor agricultural tarred roads or on little secondary roads without much traffic. Days 6 and 7 are a little bit hilly. Routes maybe subject to change or alteration. All route notes, maps and day-by-day information will be given to you upon arrival at the first hotel or at the welcome meeting. 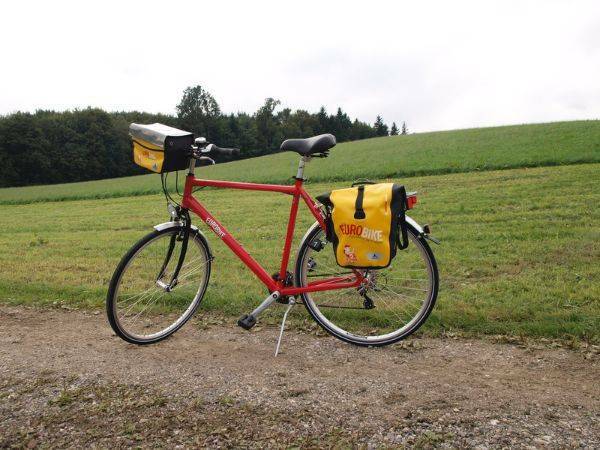 GPS/GPX Files are available for most our the cycling holidays we offer. Please ask us for details. We recommend flying to Strasbourg, Basel or Karlsruhe Baden-Baden airport to reach the starting point of this cycling holiday. Flights are available with a number of airlines to your required airport or you can travel to the start using alternative methods such as rail or road. We recommend using Skyscanner to find the best flight prices by date or Voyages SNCF for European rail travel. There is customer car parking available at most hotels for a supplement. Please contact us for more details. Please use local transport to arrive at the starting point or call us on 0800 755 5385 for more specific travel advice. You do not need to go back to the starting point of the cycling holiday as all hire bikes are left at the final hotel. Important: Please book your flights only after the cycling holiday has been confirmed by invoice or email. Flights and transfers are not included in the advertised holiday price. The Alsace Vineyards and Villages cycling holiday includes the daily transfer of luggage to the next hotel and local support if required. This cycling holiday uses quality crossbar and unisex hybrid bikes based on KTM frame technology, Selle Royal saddles, Shimano components and puncture-proof tyres to ensure that you have an enjoyable cycle tour. The bikes feature modern V-brakes, aluminium frames with mudguards, comfortable saddles and a rack for a supplied waterproof pannier. 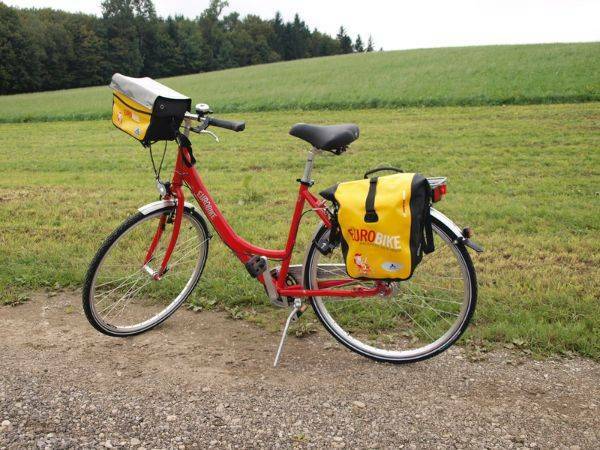 You will also receive a handlebar bag and map holder for easy navigation when riding your daily itinerary. Prices advertised on the website include standard bike hire (unless stated). Colour and specification may vary from the image shown. If you would like GPX files for a suitable device, please request them at the time of booking. Devices are not provided and please make sure that you bring along with you any fittings required to attach the Garmin (or similar) to the handlebars. You might want to download maps onto your phone to avoid data charges when roaming. All bikes are provided with standard flat pedals. You can bring your own cycling pedals, but ensure that you have the correct tools to remove the pedals if the tour does not have a welcome meeting. You may also not be able to travel through airports with the tools if you are carrying hand luggage only. You can rent a men's bike with a crossbar, unisex/female bike with a sloping tube or an electric bike for a supplement. 7 speed bikes are equipped with a Shimano Nexus gear hub and 21 speed bikes have a Shimano Alivio derailleur. We request 21 speed bikes for all cycling holidays (when available). When you make a booking with us, we take your height(s) and the appropriate bike size is matched up accordingly. Unisex frame 21-gears with freewheel. Sizes: 56 / 51 / 46 / 43 cm. Unisex 7-gears-bikes with back pedalling brake. Sizes: 56 / 51 / 46 cm. Men’s speed bikes 21-gears with free wheel and crossbar. Sizes: 64 / 60 / 56 "sloping" cm. Helmets are not provided and you will need to bring your own to use. We always recommend wearing a helmet when on your cycling holiday! This cycle tour benefits from bike insurance against rental bike theft and damage in the holiday price. Please make sure you lock up the bike, leave it where told by the hotel and treat your hire bicycle as if the bike was your own. Any negligent treatment of the bike will exempt you from cover. We advise you to ensure that you have adequate travel insurance for your cycling holiday prior to arrival. Why not upgrade your cycling experience to an E-Bike (Electric Bike)? Using a power assisted bike is a great way to go on a cycling holiday and will help you smooth out inclines or longer days in the saddle. Each E-Bike features an LCD display, removable batteries for easy charging and assistance up to 25 km/h with a range of around 120 km for each full charge depending on usage. 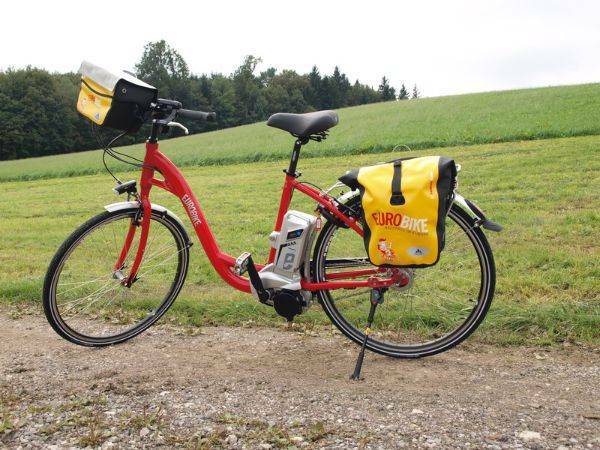 E-Bike upgrade prices vary per tour, but if you require any more information about bike hire and electric bikes, please get in-touch with us on +44 (0) 800 7555385. This cycling holiday stays in good quality hotels with private facilities carefully selected for their proximity to your cycle route and comfort. If you wish to know specific information about the hotel facilities, Wi-Fi and upgrades used on the holidays, please contact us on +44 (0) 800 7555385 for more information. Please note that the hotel list is subject to change and should be used as a guide only. We will confirm the exact hotels prior to arrival. You will receive your final hotel list approximately 4 weeks prior to your arrival date detailing the hotels used on your cycling holiday. If you wish to know more about the hotels prior to completing a booking form, please contact our Customer Services team via email or by phone. You can find out more about this cycling holiday by completing a Contact Form or call 0800 755 5385 to speak to one of the team.